Iran's Minister of Information and Communications Technology Mohammad-Javad Azari Jahromi said nearly 70 percent of Iraq’s internet services are being supplied by the Islamic Republic. Iran is using its northwestern border region of Piranshahr as a main hub to transit internet to Iraq, Azari Jahromi said on September 12, Fars news agency reported. 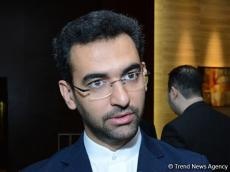 Azari Jahromi further detailed the accomplishments of the ministry, including the rise in the average internet speed, villagers’ enhanced access to online connectivity and the development of infrastructure necessary for the adoption of e-governance agendas. Earlier, he had stressed the need to publicize the performance of all government bodies, adding that the government is starting to place its trust in the younger generation.